Create a directory for the POMONA installation [for example, type mkdir /disk1/POMONA in an "xterm" terminal window]. Go to the selected install directory [cd /disk1/POMONA]. Via a web browser: Right-click the download links below and select "Save Target As", "Save Link As" or "Download Linked File (As)" (depending on the browser type), and save the files into the selected install directory (Be sure to retain the exact file name shown below). In most cases, no arguments will be required. It will be sufficient to make the install scripts executable (by typing "chmod +x install.com"), then run the install.com script. Use the command ./install.com +help to generate a list of install command-line options. Note: All required environment variables in the pomona_init.com script will be filled during the installation procedure, while the optional environment variables are required to be input manually by the users after the installation. Please check here to see a full list of the environment variables defined in this initialization script. TALOS-N REQUIRED to prepare inputs for all POMONA alignments. ROSETTA required to prepare and run CS-RosettaCM and CS-Rosetta approaches. POMONA provides all required inputs/scripts for running the CS-RosettaCM comparative modeling, for which the RosettaCM module from Rosetta software suite is needed. Note: See here also for a tutorial on how to install and use the Rosetta program. required to prepare the database for pairwise POMONA alignments. REDUCE required to prepare the database for pairwise POMONA alignments. BLAST required to prepare de novo fragment candidates for CS-Rosetta/CS-RosettaCM. BLAST generates amino acid sequence profile from sequence alignments. What is POMONA and CS-RosettaCM? POMONA is a newly designed NMR chemical shift guided protein structure alignment method to generate protein templates with the best matched local structure from the Protein Data Bank. It is based on experimental input data comprising 13Cα, 13Cβ, 13C', 15N, 1Hα, and 1HN NMR chemical shifts, plus sparse NOEs if available, and directly exploits the powerful bioinformatics algorithms previously developed for sequence-based homology modeling. POMONA is shown to identify structural homologues in the absence of significant sequence similarity. When in combination with a subsequent chemical shift based Rosetta comparative modeling (CS-RosettaCM), the well selected POMONA structural templates enable the generation of full atom models that are demonstrated to match well to the corresponding structures experimentally derived from X-ray diffraction or NMR data. The POMONA/CS-RosettaCM protocol is proven as an alternate approach to protein structure determination from a minimal set of NMR input data, which is applicable to larger proteins representing a wide variety of folds. pomona [+] [-] master script to run POMONA/CS-RosettaCM (click left to see all allowed options). -in [none] Input Chemical Shift Table. -pdb [none] Reference PDB Structure Input. -noe [none] NOE Restraint Input File (NMRPipe format). -keepTails [default] To Keep Flexible Tails. -trimTails To Trim Flexible Tails and Use Trimmed As Input. -selRes2Trim [none] List of Specified Tail Residues to be Trimmed. -offset [default] Apply CS Offset Correction If Needed. -iso Apply 2H Isotope Correction to CA/CB Shifts. -db [PDB] List of PDB Database (default) or .pdb Files to be Searched. -excl [none] List of Proteins (PDB Identifiers) to be Excluded. -maxSeqID  Max Sequence Identity to be Searched. -wCS [1.0] Weight for Chemical Shift. -wAA [0.1] Weight for Amino Acid Sequence. -count  Number of Top Alignments. -minLen  Min. Allowed Alignment Length. -maxGapLen  Max. Allowed Length for a Single Alignment Gap. -gapI [5.0] Initial Gap Opening Penalty. -gapE [0.3] Gap Extending Penalty. -CaDist0 [6.5] Min. Ca Dist to Penalize a Gap Opening in Database Protein. 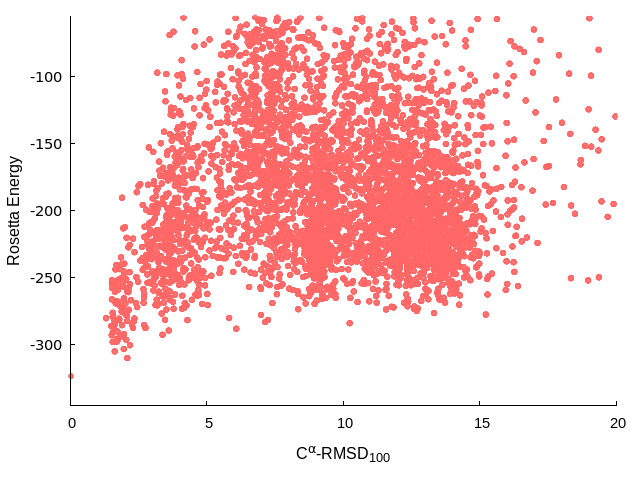 -rmsdCut [4.0] Cluster Distance Cutoff of Ca-RMSD. -rosettaCM Generate CS-RosettaCM Scripts and Inputs. -nohoms Exclude Blast Identifed Homologs from De Novo Fragments. -NSelCluster 10 Number of Selected Cluster of POMONA Alignments. -NperCluster 2td> Number of Selected Alignments per Cluster. -MPI [default] Use MPI for POMONA Alignment. -noMPI Do not Use MPI for POMONA Alignment. -MPI_np  Number of Processes for POMONA Alignment. pomona_init.com [+] [-] initialization script to define all required and optional environment variables to run POMONA master script pomona. demo/ [+] [-] directory with example chemical shift input data and scripts for a demo of POMONA. POMONA system is desiged to, utilizing majorly the backbone and 13Cβ chemical shifts, to (1) identifying all possible structural homologues from the PDB, (2) generating the pairswise structural alignment to specific protein(s), and (3) preparing and applying CS-RosettaCM comparative modeling. To use these features of POMONA, users need to follow the below procedures to properly prepare and inspect their NMR input data. POMONA requires an input chemical shift table of standard nmrPipe/TALOS format. An example portion of the required chemical shift table format is shown below (full example: ubiq.tab). Other examples can be found in the POMONA/demo directory, or at the POMONA Server site. The chemical shift input file for POMONA uses the general-purpose NMRPipe table format. All 13C chemical shifts (including 13Cα, 13Cβ, and 13C') should be referenced relative to the methyl groups of 4,4-dimethyl-4-silapentane-1-sulfonic acid, or DSS. The 15N chemical shifts should be referenced relative to liquid ammonia at 25 degrees C.
Use the optional DATA FIRST_RESID line to specify the first residue ID number of the sequence. If it is not specified, residue numbering is assumed to begin at 1. The protein sequence should be given as shown, using one or more DATA SEQUENCE lines. Space characters in the sequence will be ignored. Use c for oxidized CYS (Cβ ~ 42.5 ppm) and C for reduced CYS (Cβ ~ 28 ppm), h for protonated HIS and H for deprotonated HIS, in both the sequence header and the shift table. Use X for residues other than the usual 20 amino acids. The data table must include columns for residue ID (listed as RESID in the VARS header), one-character residue name (RESNAME), atom name (ATOMNAME), and chemical shift (SHIFT). The table must include a "VARS" line which labels the corresponding columns of the data table. The table must include a "FORMAT" line which defines the data type of the corresponding columns of the table. As noted, there is an exception for naming Gly assignments, which should use HA2 and HA3 instead of HA. In the case of Gly HA2/HA3 assignments, POMONA will use the average value of the two, so that it is not necessary to have these assigned stereo specifically; for use of POMONA, the assignment can be arbitrary. Note however that the assignment must be given exactly as either "HA2" or "HA3" rather than "HA2|HA3" etc. Other types of assignments may be present in the chemical shift table; they will be ignored. See also here for more details regarding the NMRPipe/TALOS format and NMRStar format. 76 G  C Secondary Shift:  4.250 Limit:  1.925 ! The chemical shift outliers, especially those with highly unusual chemical shifts, for which secondary chemical shifts deviate from the expected range by more than 2 times of the normal range of secondary chemical shifts, may correspond to experimental errors, and need to be inspected carefully prior to using them. For example, as shown in the above example, the identified chemical shift outlier from residue 76 correspond to a C-terminal carboxylate instead of a backbone carbonyl. Note that scripts applyOffsetCorrection.com and applyIsotopeCorrection2CACB.com will apply corections to the orginal chemical shift input files, while the orginal input file is re-named with a .orig suffix. POMONA has a default option (-offset) to check the referencing offset and apply the possible correction for the chemical shift input, as well as an option (-iso) to apply the 2H isotope correction on the fly. However, it is still recommended to users to properly prepare and carefully inspect their chemical shifts prior to using them as input to POMONA. 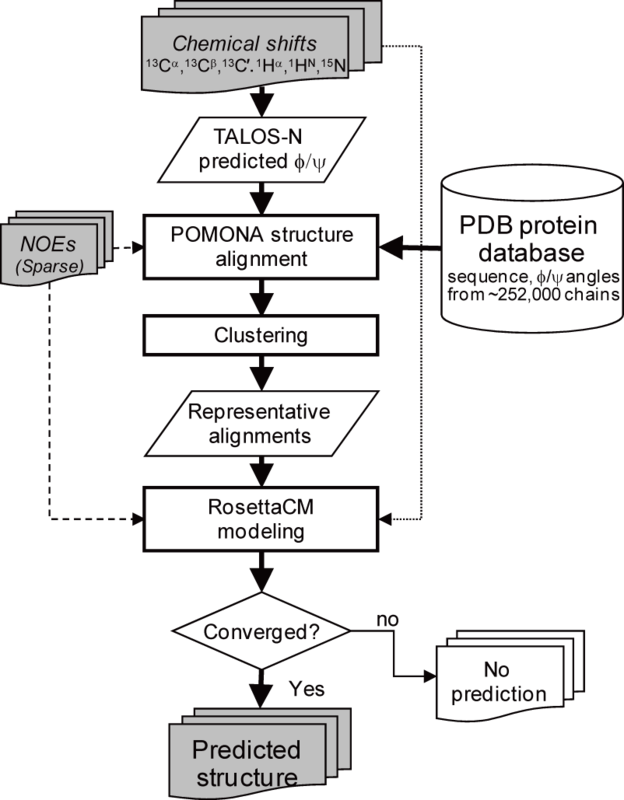 For a query protein with known backbone and 13Cβ chemical shifts, POMONA is designed for (1) searching the Protein Data Bank (PDB) for proteins with best matched (local) structure, (2) aligning to any specific protein(s) according to their local structures, and (3) prepare all data and scripts for running a CS-RosettaCM structure generation procedure. Create a directory for the prediction session; all subsequent commands will be executed from this directory. Prepare the input table of chemical shift assignments (for example "myshifts.tab") with a proper format (see the previous section); please also carefully inspect the chemical shifts for the possible referencing offset and outliers. It first runs TALOS-N program for predicting various structural factors, such as the backbone torsion angles and the secondary structure, which are used as inputs for the following step of POMONA database searching. All protein chains (~225,000) in the PDB are divided into 11 subsets, each of which is used to construct a pre-defined POMONA PDB database (with a name of pdb_? ?.and stored at $POMONA_DIR/data/pdb/). During the PDB database searching, a summary file "pomona.pdb_? ?.tab" is created to store the best aligned structures obtained from searching a given PDB subset. After searching all PDB subsets, a final clustering and summarizing step is performed for all identified alignments. By default, top 1000 alignments with the highest alignment score are kept, the number of selected alignments can be specified with an option -count POMONA option to specify the number of selected alignments for output, the alignments are selected based on their total alignment score.
. For those selected alignments, a clustering procedure is performed to identify aligned structures with similar global conformation, by using a default distance cutoff value of the normalized Cα-RMSD of 4 Å (or a cutoff value speicified by an option of -rmsdCut POMONA option to specify the distance cutoff used for clustering the top selected alignments in terms of the similarity of their global conformation, which is measured with a metric of the normalized Cα-RMSD calculated for the aligned residues. are generated, for storing the summary of the identified alignments and the details of the structure alignments, respectively. Sample POMONA Summary File "pomona_sum.tab"
Sample POMONA Alignment File "pomona_aln.tab"
The PDB database searching by POMONA typically takes hours to days for a protein with normal size, therefore the parallel searching mode is highly recommended when multiple cores are available for a computer or a computer cluster, which can be speficied by an option of -np Number of total processes for POMONA alignment. [+] [-] Click left to see a full description of all optional alignment parameters. -in         [None]   Input Shift Table. -inTitle    [None]   Input Shift Table Title. -pdb        [None]   Reference PDB Structure Input. -pdbTitle   [None]   Reference PDB Structure Input Title. -noe        [None]   NOE Restraint Input File (Rosetta3 format). -noeTitle   [None]   NOE Restraint Input Title. -offset     [false]  Apply CS Offset Correction If Needed. -iso        [false]  Apply 2H Isotope Correction to CA/CB Shifts. -db         [PDB]    List of PDB Database (default) or .pdb Files to be Searched. -excl       [None]   List of Proteins (PDB Identifiers) to be Excluded. -maxSeqID       Max Sequence Identity to be Searched. -wCS        [1.0]    Weight for Chemical Shift. -wAA        [0.1]    Weight for Amino Acid Sequence. -minLen          Min Allowed Alignment Length. -maxGapLen       Max Allowed Length for a Single Alignment Gap. -gapI       [5.0]    Gap Opening Penalty. -gapE       [0.3]    Gap Extending Penalty. -CaDist0    [6.5]    Min. Ca Dist to penalize a gap opening in database protein. -rmsdCut    [4.0]    Cluster Distance Cutoff of Ca-RMSD. -NSelCluster     Number of Selected Cluster of POMONA Alignments. -NperCluster      Number of Selected Alignments per Cluster. -MPI                 Use MPI (default) for POMONA Alignment. -noMPI               Do not use MPI for POMONA Alignment. -MPI_np          Number of processes for POMONA Alignment. POMONA Server can be used for the purpose of searching structure alignments from the PDB, users need to submit their input chemical shift file to the server with a default All PDB Proteins option. The server will send the results to the users via email. Note that only the final alignment files pomona_sum.tab and pomona_aln.tab will be sent. where the names after the option -db are for the PDB file of the protein(s) to be aligned. Note that the PDB file should have a standard format as those from the PDB database. POMONA Server can be used for pairwise structure alignment. When submit chemical shift input file of the query protein to the server, users need to (1) select the option of Selceted PDB Protein(s) and (2) type in the PDB identifer of the protein(s) to be aligned. Note that the option to align a local PDB file currently is not provided by the server. It firstly runs POMONA to identify 1000 (or any number defined by the -count option) top structure alignments and applies clustering to them in terms of the similarity of their global conformation, see above sections for the details of running POMONA alignment. Next, it selects top 2 alignments (or any number of alignments specified by the option -NperCluster) from top 10 clusters (or any number of clusters specified by the option -NSelCluster), which are stored at an output file pomona_selected.aln. t000_.200.9mers.gz Chemcial shift based Rosetta de novo 9-residue fragment file. t000_.200.3mers.gz Chemcial shift based Rosetta de novo 3-residue fragment file. pomona_selected.aln POMONA alignments selected as structural templates. in.tab TALOS format chemical shift input file. noe.cst NOE contraint file (Rosetta format). ?????_? ?.pdb Threaded input structural templates. runCSRosettaCM master script to run CS-RosettaCM. analyzeCSRosettaCM master script to analyze CS-RosettaCM results. Users then need to run the generated script runCSRosettaCM in csRosettaCM directory to start the CS-RosettaCM structure modeling. Note that the script runCSRosettaCM may require a manual modification if the Rosetta installation environment is not properly configured, or for performing parallel jobs on computing clusters. *.pdb Extracted pdb files for CS-RosettaCM generated structures. Note that (1) the RMSD value is calculated to the lowest energy model, i.e., the one with the lowest "rescoredEnergy" as shown in the name.scores.txt file; (2) the RMSD value is calculated for the ordered residues only, as those defined in the orderedSegmentsFromRCI.txt file. For more information regarding the evaulation of the generated data, please see the next section of "How to Select Consistent POMONA/CS-RosettaCM Predictions". After CS-RosettaCM job is done, run CS-RosettaCM structure analysis by using the master script analyzeCSRosettaCM. The convergence criterion on the lowest energy CS-RosettaCM models can be inspected by checking the output from running the analysis script analyzeCSRosettaCM, see below for an example from a demo POMONA/CS-RosettaCM modeling for protein Ubiquitin. This script automatically finds the 10 lowest energy CS-RosettaCM models, calculates the Cα-RMSD values relative to the mean coordinates of these 10 models. 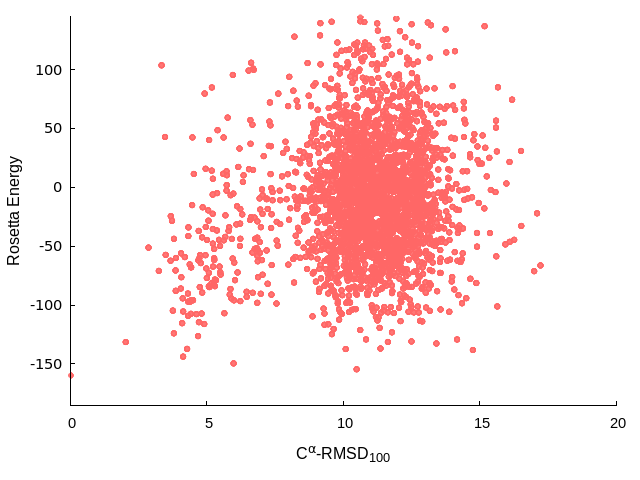 A Cα-RMSD100 value, calculated from Cα-RMSD/(1+ln(N/100)), where N is the number of residues of the protein, is then used to judge the convergence of the CS-RosettaCM modeling, i.e., the generated CS-RosettaCM models are converged ONLY when the averaged Cα-RMSD100 value is below ~ 2.5 Å. Note that although results where clustering of the lowest energy structures is less tight than 2.5 Å may still be useful for further analysis, such results should not be over-interpreted and could be in error. The convergence can also be visually inspected by plotting the Rosetta energy versus the Cα-RMSD (to the lowest energy model) value, which can be found as the last two columns in the output file ExtractedPDBs/name.scores.rms2Low.txt. 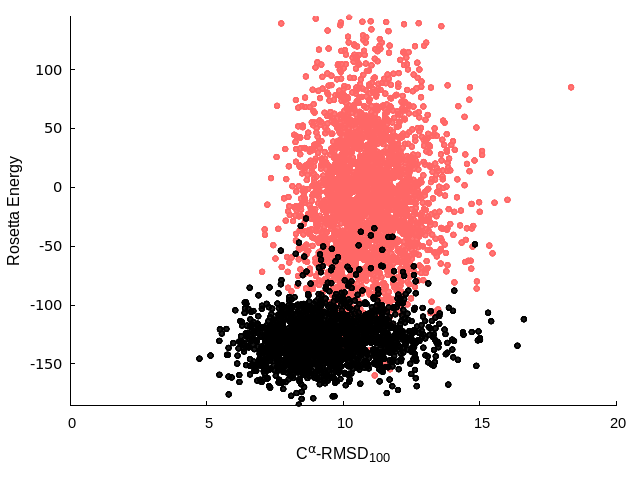 See below for two such plots generated from a POMONA/CS-RosettaCM modeling for protein s.rhodopsin and mad2, for which the convergence is observed for the models of protein s.rhodopsin but not for the models of protein mad2. A second requirement for accepting a CS-RosettaCM structure is that the total Rosetta energy (incl. the chemical shift scoring term) is significantly lower than those lowest values obtained by CS-Rosetta models. The standard CS-Rosetta de novo structure generation procedure is provided based on a well-refined fragment assembly and full-atom refinement procdure, which can sample and generate full-atom structural models with low energy for proteins with small and medium size. CS-Rosetta will typically fail for large proteins, but the lowest energy that a CS-Rosetta procedure reach can be used as a second standard to judge a CS-RosettaCM modeling (for larger proteins). For details regarding the standard CS-Rosetta protocol, please check our CS-Rosetta website. When preparing the CS-RosettaCM with the "pomona -in myshifts.tab -rosettaCM" command, a csRosetta package/directory other than csRosettaCM is also generated. With a similar procedure to run CS-RosettaCM modeling and analyze CS-RosettaCM models, the reference CS-Rosetta modeling can be performed by using the runCSRosetta script, the generated CS-Rosetta models can be anaylzed with the analyzeCSRosetta script. The Rosetta energy of the lowest energy CS-Rosetta models can be found in the output file csRosetta/ExtractedPDBs/name.scores.txt. 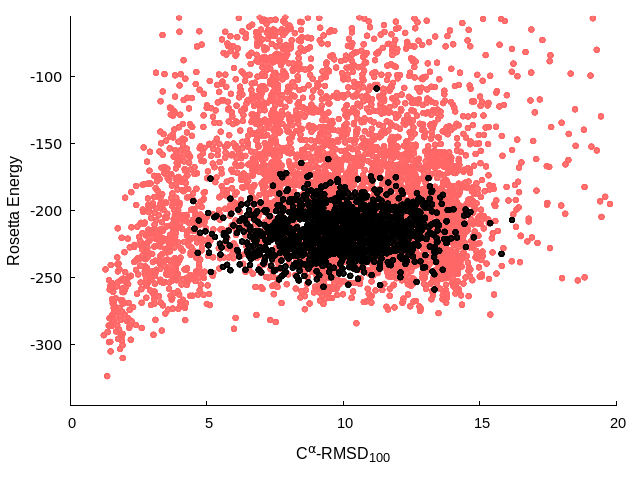 See right for two plots generated from a POMONA/CS-RosettaCM modeling for protein s.rhodopsin and mad2, for which the lower energy is observed for the converged CS-RosettaCM models (red dots) of protein s.rhodopsin; while for protein mad2, for which both the CS-Rosetta models (black dots) and CS-RosettaCM models (red) are not converged, the lowest energy CS-RosettaCM models show higher energy.